PARIS --- Established by the intergovernmental agreement signed on November 7, 2018 by French Armed Forces Minister Florence Parly and Minister of Defense of the Kingdom of Belgium Steven Vandeput, the CaMo strategic partnership establishes an increased cooperation, especially in the field of operations, between the land forces of the two countries. It intervenes on the occasion of the renewal of the Belgian motorized component and the French median armored segment and must guarantee a maximum interoperability in operations. It is a continuation of the cooperation already established between the Belgian Army and the French Army, while distinguishing itself by a level of integration unequaled. The acquisition part of the partnership covers 382 GRIFFON multi-role armored vehicles and 60 JAGUAR armored reconnaissance and combat vehicles, fully equipped according to the SCORPION program and fully compatible with their French counterparts. These vehicles will be delivered to the Belgian ground forces from 2025. An innovative scheme called client (client state) / agent (French State acting as delegated developer) is implemented for this agreement. 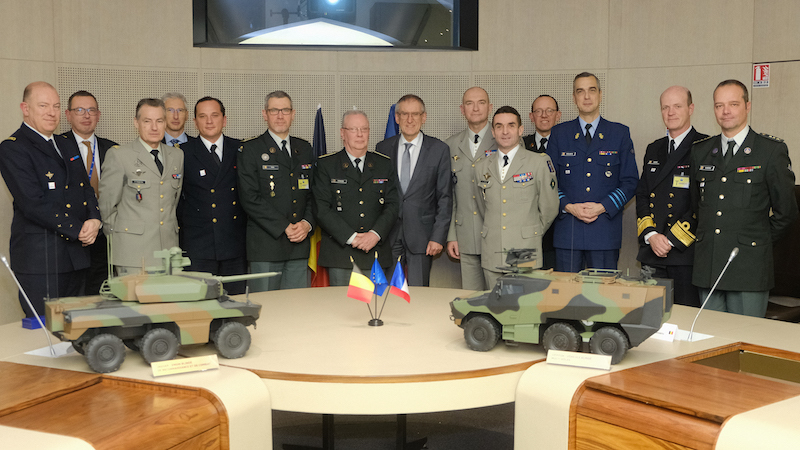 As such, acting in the name and on behalf of the Belgian State, the Directorate General of French Armament (DGA) will conduct the acquisition contract in connection with the industrial contractor Nexter, bringing all his technical expertise. The total investment budget is around 1.5 billion euros for Belgium. #CaMo ne porte pas seulement sur les équipements mais concerne également le soutien, l’entraînement, la doctrine, l’organisation et les questions de ressources humaines. The Steering Committee (CODIR) sets the guidelines and oversees this strategic partnership. It is co-chaired by the Chief of Staff of the Armed Forces General François Lecointre and the General Delegate for Armament Joël Barre for France, and by Lieutenant-General Rudy Debaene (National Director of the armament) and Major General Marc Thys (chief of the land component) for Belgium. This first meeting of the Steering Committee was held yesterday (Dec. 12) in the presence of Lt Gen Eric Bellot des Minières, France, representing the Chief of Staff of the Armed Forces, and the Director-General for Armament Joel Barre, and Major General Hervé Gomart representing the Chief of Staff of the Army for Belgium, in the presence of Lieutenant-General Rudy Debaene and Major-General Marc Thys. -- the "Program COPIL" will supervise the joint program office and the contract for the acquisition of the first CaMo capacity. A roadmap has been set for each of these COPILs by CODIR. The main French and Belgian manufacturers involved in the CaMo program were also able to present the industrial organization set up. This first meeting of CaMo CODIR concluded with the signature of the State Management Plan of the partnership by its co-chairs.